This is the biggest party of the year and you're invited. Click here to play! Grab some beads and don an outrageous costume for a chance to celebrate Mardi Gras and grab some cash! The Mardi Gras Fever logo acts as your invitation to this party so be sure to spin as many as you can. Two to five across an active pay line will get you up to 2000 coins. Next in line are the beautiful brunettes. Spin three to five of these curvaceous ladies across a pay line and you'll get up to 1000 coins. Be king/queen for the day by spinning the crowns across a pay line. Three to five will get you up to 800 coins. Also helping you in your quest for Mardi Gras cash are the blonde beauties, the band, alligator eggs, steam boats, masks, gumbo, and fruit drinks. Spin any of these across the pay lines and you'll be bringing in plenty big wins. It wouldn't be Mardi Gras without a couple of surprise bonuses, and this game definitely has that covered. Spin the jesters across the reels to trigger a number of free spins in which your prizes are multiplied. 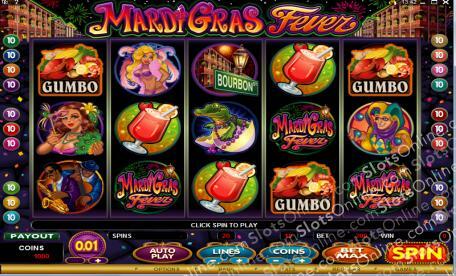 Or, spin the infamous Bourbon Street to trigger the Mardi Gras Bonus for even more chances to win! Get ready for a fabulous party! Celebrate while spinning these reels and you might just take home a handsome prize indeed! The colorful jesters act as a scatter. Spin three or more of these jovial characters anywhere on the board to trigger up to 5 free spins in which prizes are multiplied by 10. Plus, spinning three or more of the jesters will get up to 100 times your total bet! Spin three or more Bourbon St. symbols anywhere on the board and you will trigger the Mardi Gras Bonus. During this bonus you will be prompted to select three out of 12 windows. Each pick will reveal a prize, which will be added up to become your bonus prize. Spin three to five of these anywhere on the board and you will get up to 50 times your total bet.